The floor under the East Asia neighborhood (consisting of China, Japan, South / North Korea, Taiwan, & Mongolia) is about to fall away. These nations (combined) equal slightly more than 20% of the global population and consume 27% of total global energy. From 2000 through 2016, this region (spearheaded by China) represented 48% of the global growth in total energy consumption. So, when I tell you these countries are economically entering long-term domestic declines (or perhaps outright collapses), the impacts will reverberate everywhere. 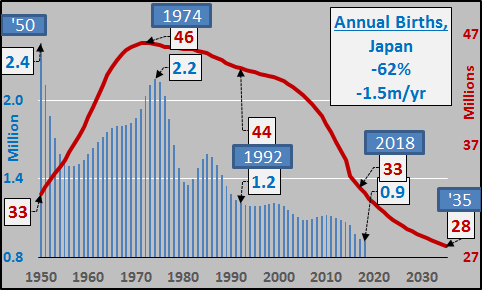 Why domestic economic decline or collapse? This is simply following a massive population decline which has already taken place (past tense). 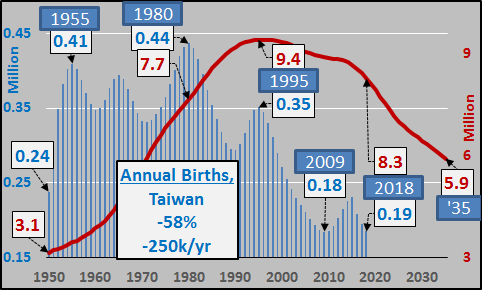 The chart below details the 44% fall in births since the double peaks seen in East Asia in '67 and '89. This is an ongoing birth dearth of over 14 million fewer annually, since 1995. 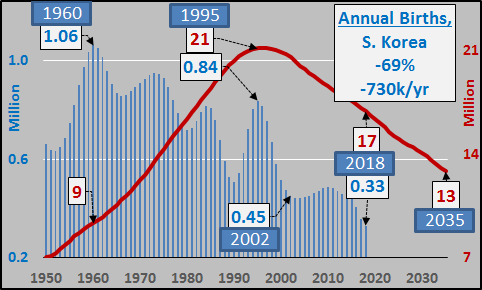 Now this birth dearth will be compounded by the rapidly falling childbearing population of 15 to 39yr/olds, represented by the red line below (I exclude the 40+yr/olds because they simply have so few children as to simply create distraction). 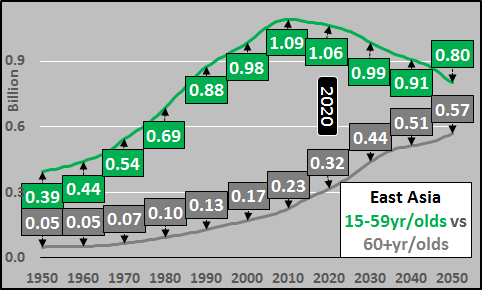 By 2035, the East Asia child bearing population will decline by 30% or -202 million (no estimation, this population is already born and will just shift forward). Absent some seismic shift (or turning away from the inflationary urbanization underway? 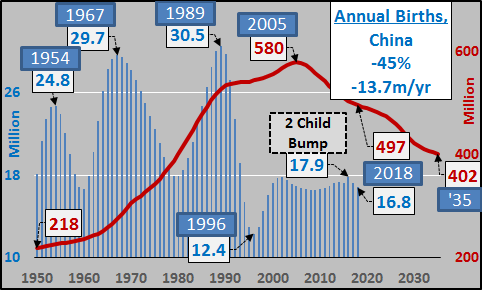 ), births will continue to tumble and national populations will ultimately likewise crumble. Noteworthy above is the low water mark of just 15 million births in 1996...and the muted L shaped aftermath. Those born in 1996 will be 23 years old in 2019, or generally entering adulthood. 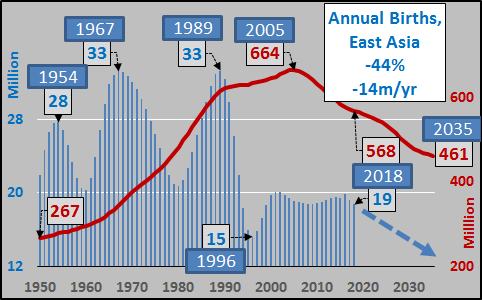 On an annual basis, this is a relatively sudden 50%+ decline in new adults, new potential employees, new potential parents, new potential consumers entering the economy...and this is just the start of the "new normal". Every year, from here forward, a 50% decline (relative to just five years ago) in potential demand and potential employees will leave the regions economies reeling. All the economic overcapacity, housing overcapacity, and bad debt will be left "swimming naked" among the ongoing collapsing demand. The situation, nation by nation, is detailed below...showing both annual births (blue columns) and childbearing populations (maroon line). 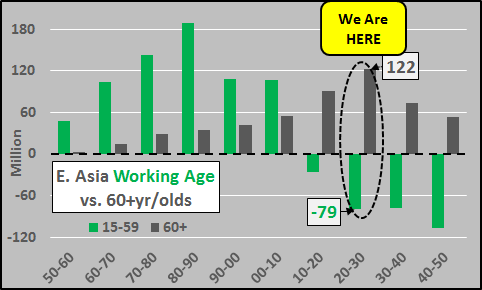 East Asia working age population (15-59yr/olds) vs. 60+yr/old population, chart below. Surging elderly against falling working age population. Below, the decade over decade change basis, working age versus elderly. The 2020 through 2030 decade will be demographic hell. 60+ year olds will increase by 122 million against a decline in the working age population of nearly 80 million. This will break all the bad promises made in the good times and bring an economic / financial firestorm. Unfortunately, I don't have any solutions to resolve what is about to take place. I could show similar demographic issues among East Asia's primary export markets; in Europe (a population that consumes 14% of global energy), Eurasia (consuming 8%) or N. America (consuming 21% of global energy). But growth in these regions is in the past tense, and it was only East Asia (China) that was able to delay the ultimate economic fall via the greatest debt gambit in history. Unfortunately, it was always doomed to fail and an indefinite period of outright global decline is now underway. Interest rate cuts, deficit spending, and central bank buying of assets will not fix or ameliorate the declining demand nor allow adequate growth to sustain the current system. It's time to stop pretending we can grow our way out of the debt hole / asset bubble we are in amid a long term decline which is just getting started. There may still be time to rethink the whole system, salvage the good, jettison the bad, and acknowledge the pain of reality...before this is chosen for us, likely at the worst time and place possible.